Arnes Ant (Arnemyran in Swedish) was born in the early summer of 1982. I was fishing Ljustorpsån, a small stream you find a bit north of Sundsvall. In Ljustorpsån - primarily seen as a trout water - graylings are relatively numerous, but quite small in size. The glossy surface of the water was occasional disturbed by some graylings rising - it was time for dry fly fishing. 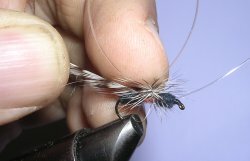 Back in -82, I preferably fished with very light dressed, Einar Björkegren-influenced, dry flies, but since Ljustorpsån is a typical lowland, forrest surrounded river, with a lot of anthills near the shore, I was interested to try an ant-imitation. 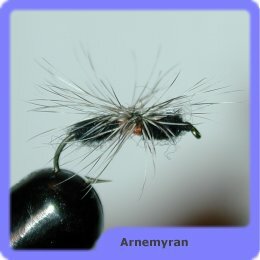 In my collection of various unsorted pattern I found the fly that Pelle many years later was to name Arnemyran. The fly catched a nice grayling, big enough to keep, this evening, and thereby lost its innocence - a not too impressive results may seem, but perfectly acceptable to be a catch in Ljustorpsån. The fly was tried again, and again, and to this day date no other patterns have been able to replace it as my natural first choice at the fishing grounds. 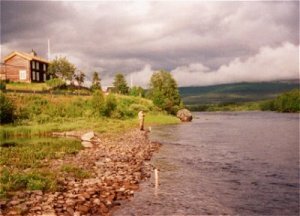 Arnemyran has demonstrated great all-round features and catches fish far up in the mountain areas in the northern parts of Swedan, as it did in my childhood forrest based lowland river. To my experience, it is not easy for a fly pattern to win a fly fisherman's full and unreserved confidence. 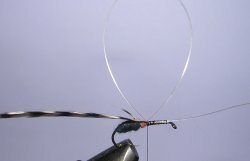 The fly must first undergo a lengthy process, where its ability to attract fish to bite is constantly compared with the favorites, previously subjected to the same critical scrutiny. 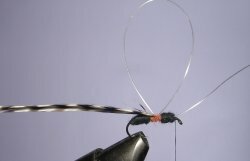 If the pattern is able to meet the fisherman's high expectation, it can look forward to a bright future as one of the few fly patterns that share virtually all of the fishing time. But in addition to regularly catch fish, I think a fly must be a part of a special occasion before it becoms one of the specially selected - something happens that the fisherman will never forget. For me and the ant, this happend in the Norwegian river Glomma. Anyone who is familiar with the fishing around Os in Glomma, knows that a couple of kilometers downstream the village you find a pier of gravel a bit out in the river. Outside the pier, the river is slow and the water is deep. The pool ends up in a more rapids part where, at least the past, it was common to see some decent grayling. At the occasion some fish was also active in the slow and deep part of the river, a bit further up. The fish raised wery quiet and calm, and I judged that the fish took something that was floating in the water's surface film. It was time to try the ant. The bite was calm and quiet, just as in the earlier observed raise. What went wrong, I do not know, but a few seconds later, I stood there with shaky legs and a broken hook. 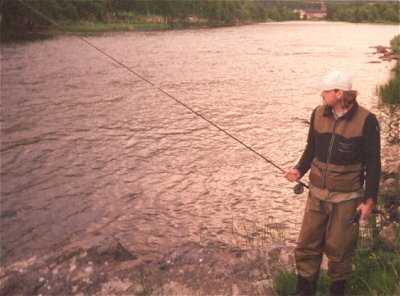 Immediately after the strike, the fish taken off to the rapids, and because the rapid was long and it was impossible to to follow the fish downstream, it was necessary to try to stop it. I have often wondered what it was that took the ant, that night at the gravel pier in Glomma. Was a huge grayling, or maybe a trout? Or, is the fact that that both the event and the fish has grown larger over the years? The answer of these questions are not so important anymore. But more important, that evening, the ant took the final step on its long journey towards the parlor of the fly-box- a place still occupied today. 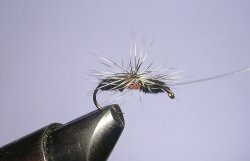 The first version of the ant had a brown hackle, and I have tried all possible coulors since then. 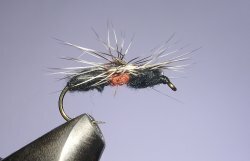 One reason that the main pattern has a grizzle-hackle is that it then becomes easier to see the fly on the water surface, and another is that grizzle hackles generally are of excellent quality, higher than other coulors - noticable even in these times of high quality Witting Farms produced necks. You can vary the coulor of the hackle, but changing the body colors has never proven successful, and I claim that the body must have the colors that are specified below. 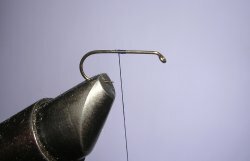 Finally, a few tips on how to fish the ant. If the fish are active in the surface, it is really no question about how to fish the fly - classic dry fly fishing is what you do. One of the real merits of the ant are shown when the fish do not really breaks the surface, and instead clearly are taking something just under the same. In this case, cast upstream and drawn the fly, with a small jolt, just below the surface. After this, you have to keep track of where the fly it is located, and do the counter-thrust when a movement is visible close to where the fly should be. For the lazy fisherman it is also recommended to soak the ant properly and fish it as a wet fly - several graylings has been caught that way. 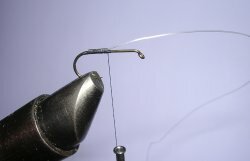 With this said, Arnes Ant is really an all-rounder that can save you some headache when searching for fish in a new fishing water. Hopefully, on some occasion it will be the difference between an empty fish basket, something that most of us know can cause a great amusement for our fishing buddies, or not. Good luck! - Thread. We choose a black thread. - Parachute hackle base. We use an ordinary nylon leader, 0,20, for this. - Hackle. We tie a parachute hackel - grizzle of better quality. - Body. Front- and rear-parts are made of Flytite #2 (black), and the middle section are made by Flyrite #5 (rust). Tie the thread back to where shaft ends and tie in the nylon thread, pointing forward. 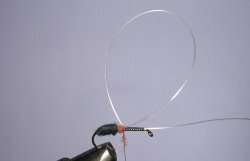 Create the rear body-part with black dubbing - leave a couple of milimeters without dubbing nearest the nylon thread. Attace the hackle - remember to fix it as firm as possible, but without the risk it will loose. 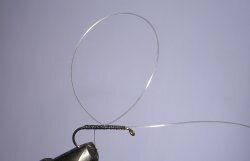 The parachute hackle is created around the nylon loop, four to five laps. Make sure that every lap are wrapped under the lap tied in before. Cut the nylon string at the head, put a drop of varnish at the base of the parachute hackle and pressure it down with your thumb to get the correct shape, and finally we have our Arnemyra!